The conventional hatchery feeding schedule for the marine shrimp, Penaeus vannamei, during the post-larval stages consists of a combination of newly hatched nauplii and commercially available dry diets. In an effort to reduce operating costs during the period of highest feed consumption, a series of feeding trials were conducted at the Kahuku Shrimp Company hatchery using frozen Omega-3 Enriched Artemia biomass as a complete replacement for live Artemia nauplii during the stages PL-3 through PL-9. The Omega-3 Enriched Artemia biomass diet was fed to 104 larval rearing tank (LRT) replicates over a 12-month period. Artemia nauplii was fed to the LRT’s from stages Mysis-1 to PL-2 and was discontinued thereafter. The average stocking density for each 3000-liter larval rearing tank was 150 P. vannamei nauplii per liter. Average survival to PL-9 was 59% or 88 post-larvae per liter at harvest. The control LRT’s receiving 100% live Artemia nauplii recorded an average percent survival to PL-9 of 55%. Average stocking and harvest densities were essentially identical to the test LRT’s. The Omega-3 Enriched Artemia biomass diet was fed according to the following schedule. The control LRT’s consumed an average of 6 kilograms of Artemia cysts per one million post-larvae produced. At the current market price of $25./lb., Artemia cyst costs were calculated to be $300. The Omega-3 Enriched Artemia biomass fed LRT’s consumed an average of 1.5 kilograms of Artemia cysts per one million post-larvae at a feed cost of $75. The significant savings in feed costs and the negligible difference in the LRT survival between the control and test diet LRT’s demonstrate that the Omega-3 Enriched Artemia biomass can be used as a viable replacement for Artemia nauplii during the post-larval stages. Processing: Artemia biomass are harvested and immediately enriched at our holding facility using an enrichment emulsion rich in essential fatty acids (HUFA’s). Following the enrichment process, the Artemia biomass are rinsed, packaged, and blast-frozen to insure quality. What is bioenrichment of Artemia nauplii? Artemia are non-selective, continuous filter feeders. Anything that is the right particle size (10-50 microns) can be taken into the gut of the live Artemia. Thus, Artemia can essentially deliver food components or nutrients to your fish through several hours of bioencapsulation or bioenrichment. Are there commercially available bioenrichment formulas available on the market? Yes, there are several bioenrichment formulas available providing Highly Unsaturated Fatty Acids (HUFA) in the form of EPA and DHA. 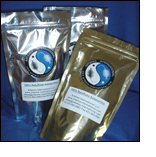 These bioenrichment formulas are primarily available through aquaculture supply companies for enriching live rotifers and Artemia for marine shrimp and fish hatcheries. What exactly are in these bioenrichment formulas? These high HUFA emulsion formulas are essentially emulsified fish oils (cod or menhaden oil). These formulas also contain antioxidants as preservatives and may be fortified with vitamins. How can I make my own fish oil emulsion? Purchase cod liver or menhaden oil and find a source of lecithin (powdered or liquid). A 3-5% inclusion of lecithin to the fish oil is all you need. Add some water to the fish oil and lecithin and blend (kitchen blender) for around 30 seconds. Feed supplements, such as Naturose (astaxanthin), spirulina, or stabilized vitamin C, can be added to the emulsion as well. The fish oil emulsion can be stored in a refrigerator for several weeks. How many hours should I enrich the Artemia nauplii for? The Artemia nauplii must molt into the Instar II stage before filter feeding can begin. This occurs around 30 hours after stocking the hatch cone. A minimum of 12 hours of enrichment time is required for the enrichment formula to absorb into the intestinal tract and tissues. What density should I use during enrichment? Approximately one gram/quart of cysts or 50% of the recommended stocking density is used when enriching baby brine shrimp. This lower stocking density is used because of the reduced dissolved oxygen levels due to the fish oil emulsion. Strong aeration is recommended. Can I enrich the Artemia nauplii in the same water the nauplii were hatched in? Definitely not! The nauplii should be harvested, washed, and restocked in a clean conical tank with new salt water. Can I enrich adult Artemia biomass? Yes. Live adult Artemia are much more efficient at filter feeding than Artemia nauplii and only require 1-2 hours to enrich. The higher the water temperature, the faster the adult Artemia will pack it's gut with the emulsion. A density of 2000 - 3000 adults per quart to one gram of enrichment formula is recommended. Once the adults are fully enriched, feed them to your fish or shrimp immediately as they will continue feeding and emptying their gut of what they ingested. Otherwise, freeze the enriched biomass immediately for later feedings. Nature Haematococcus algae meal is a natural source of astaxanthin derived from a unique strain of microalgae, Haematococcus pluvialis. NatuRose is spray dried and formulated into a fine dark red powder and is currently used worldwide as a coloration and nutrition source for numerous aquatic species. It has been successfully used for pigmenting marine shrimp, rainbow trout, salmon, sea bream, and ornamental fish, koi, and poultry. Enrichment of rotifers, Artemia, and daphnia is achieved by direct feeding of NatuRose in tanks and are also used as a superior larval feed. Usage: The majority of the NatuRose carotenoid fraction is astaxanthin, which imparts the red hue to aquatic animals. Astaxanthin is sensitive to light, heat, and oxygen so precautions should be taken to protect this carotenoid from oxidation. NatuRose is manufactured with 0.3% ethoxyquin to enhance the stability of the carotenoids, and is shipped in sealed, airtight pouches. The product should be kept at room temperature (72F or 22C) or cooler to allow maximum stability during storage. When feeds are to be manufactured, a measured amount of NatuRose is added similar to using a premix. Good distribution within the total feed will ensure consistency within the final feed. Depending on the application, NatuRose containing 1.5% astaxanthin is incorporated into feeds at a final concentration of 2.5 kg to 5 kg per metric ton of feed (50-100 ppm final astaxanthin). Pelleting of feeds offers the optional conditions of low heat exposure; losses of astaxanthin generally range from 1-4%. The extrusion process popular with many feed manufacturers is also compatible with NatuRose. Losses generally range from 4-12%. NatuRose is very stable in oils as top-coating of pellets with a NatuRose/oil mixture has also proven successful. Fresh feeds made in a "batch" fashion by aquaculturists raising tropical fish or shrimp broodstock have reported improved growth, survival and pigmentation as no heat is required during the feed processing. NatuRose can be blended directly into these feeds and will offer excellent stability while frozen. NatuRose "natural astaxanthin" is now being fed to marine shrimp, koi, rainbow trout, sea bream, salmon, crawfish, abalone, goldfish, macrobrachium, and a variety of marine and freshwater ornamental fish species. Feeding protocols may differ between applications and hatchery feeding regimens. These frozen polychaetes can be utilized as a supplement or a complete replacement for other feeds. The results will be a cost savings in this area without any decline in the quality aspects of your maturation diets. Mixing - Grind semi-frozen squid and Artemia biomass in a meat grinder. Combine remaining dry ingredients. Add minced squid and Artemia biomass and water to the dry ingredients. Add more water if necessary to achieve the consistency of bread dough. The dough may be stored in the refrigerator for later use. Extruding - Pass the dough through an extruder producing a noodle diameter of around 1/8". You may have to pass the dough through the extruder more than once to obtain the right consistency. A Hobart meat grinder fitted with a 1/8" die plate works best. Drying - Place the extruded noodles on a screen and place in a shaded area for around 4-6 hours. Use a fan to accelerate the drying process. The moisture level should be around 25%. Feeding - Feed the semi-moist maturation diet at least two times per 24-hour period. At a 25% moisture level, you can feed up to 4% of the shrimp biomass per day. For example, if you have 100 broodstock at 50 grams each (5000 grams total biomass), you would feed 200 grams of the semi-moist diet per day. Storage - The semi-moist diet can be stored in the refrigerator up to one week without spoilage. Variations of this semi-moist diet using mussels, oysters, or other "virus-free" seafood can be used in place of squid or Artemia biomass. Broodstock Grow-Out: Minimum broodstock size for L. vannamei is 40 grams for females and 35 grams for males. Pond salinity should not go below 20 ppt if possible. The natural productivity from the pond will provide the majority of the nutrition for the broodstock. However, adding a high quality feed (high protein pellet or fresh squid) is a good supplement. biosecurity is an issue if White Spot virus (or others) are present. Water Quality: If your hatchery is in a location with fluctuating salinity, then you will need to go with a complete recirculation system to maintain water stability and high salinity. The best biofiltration equipment to use is from Aquaneering (Aquaneering.com). However, you can also get away with less expensive systems using rapid sand filters and oyster shell trickling filters. Nutrition: The typical maturation diet consists of squid, enriched artemia biomass, bloodworms, and a semi-moist diet. The semi-moist diet is important to include feed components such as spirulina algae, fish oil, astaxanthin (naturose), vitamin premix, and medications when necessary. These powdered ingredients are bound together using a local flour (glutin) and extruded into "noodles" (see recipe for "semi-moist maturation diet"). Management Strategy: Photoperiod can be artificial or natural. female broodstock can be maintained separate from males. Developed (mature) females are transferred daily to the male tank for mating and returned the following day. Or, males and females can be mixed (1:1 ratio) and the developed females checked at dusk for spermatophores. Broodstock populations are replaced every 4-6 months. On average, a stabilized maturation system should produce 8-10% matings (of the female population) per day. If you have 1000 females in the maturation system, you should have 100 matings per night (x's 100,000 nauplii per female) or around 10 million nauplii per day. Spawning: Mass spawning tanks (5-10 metric tons of volume) are most efficient. Tank interior should be black. nauplii are light-attracted and siphoned into nauplii collectors. Nauplii are aliquot counted and can be held up to 30 hours before stocked into larvae tanks. Marketing: Market price of nauplii is general 10% of the post-larvae price. If you are selling your PL's for $5.00 per thousand, then you can market your nauplii for around $0.50/1000. At 10 million nauplii per day, you can gain $5000. per day in sales. Ingredients: Marine proteins, plant proteins, marine oils, cereal meals, algae extracts, yeast extracts, phospholipids, minerals, vitamins, pigments and antioxidants. Feeding Regime: Start feeding broodstock shrimp one month before spawning. Up to 60% of the fresh feed (Artemia biomass, polychaetes, squid, etc.) can be substituted with the BREED-S and BREED-S CONCENTRATE products. One kg is equal to 4.5-kg of fresh feed. A 130-gram quantity and 400-grams of fresh feed is the recommended mixture. Results may vary depending on application. Please inquire regarding specific information.